Perhaps taking a lead from the Levi's Denim Monsters, French marketing firm TriBeCa, to promote the opening of a flagship LEE store, developed a street campaign for LEE jeans in which the jeans were placed over parking meters and hung from wires above the streets while manholes were painted with "LEE," banners were hung in metropolitan areas and bar coded stickers were handed out as coupons for use at retail locations. More street scene images here. No idea what this is promoting but it has to be something since no one wold normally paint themselves orange and green and roam the street smiling into the cameras. And can you say waist to hip ratio? Damn. 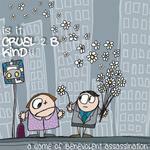 See another here. David Berkowitz vidited the Benn & Jerry's promotion that's been going on for a bit where the ice cream copmpany took over a bank in New York City's Union Square and set up tasting stations for its new line of bottled milkshake ice cream.Berkowitz reports the Chocolate Fudge Brownie and liquefied Chunky Monkey were great. Not so great was the Cherry Garcia which was likened to medicine. Check out the images of the promotion here. 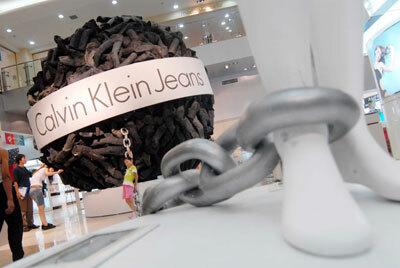 Calvin Klein Palaces Giant Ball of Jeans In Museum, Holds Contest. 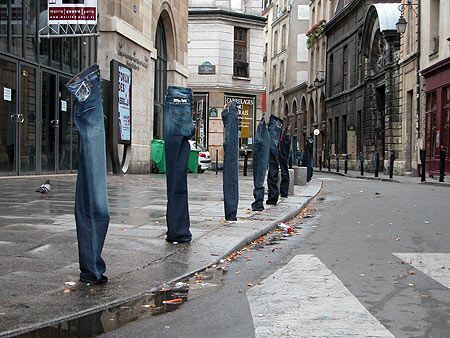 Now here's an interesting way to promote your jeans. Grab thousands of them, make a giant two ton ball out of them, slap your logo on them and put them in a museum in China. Oh, and have a contest too that gives people the chance to win $625 in cash for guessing how many jeans are in the exhibit. 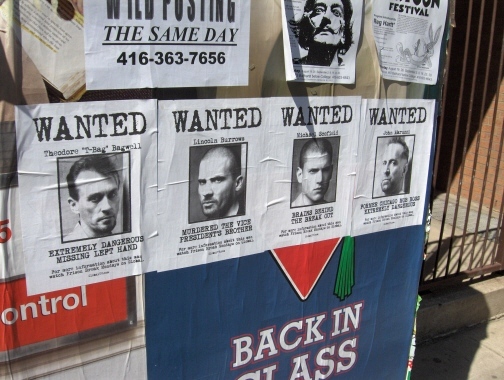 Adrants reader Sanj sends us an image of wanted poster wild postings which promote the beginning of the second season of the FOX series Prison Break. It's actually a really good show. Because it's hard to believe anyone would be stupid enough to think a sandwich bag filled with fake weed was real on a Prime TV billboard in New Zealand promoting the Showtime series Weeds and try to steal it, this "surveillance" video released on YouTube just seems like another planned social media promotion. 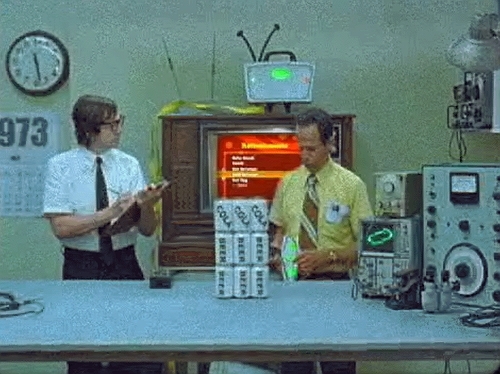 Not that that's a bad thing but we just wonder about the intelligence of those in this video. The video shows people trying to pull weed-like substance out of the big bag affixed to the board and ends with "$429 Reward. To the stoner who ruined our Weeds Billboard: please call 021 682526 to return the missing buds. Please." Oh wait, those stupid people are paid social media actors. Silly us. How could we have thought otherwise? Oh wait again. This is supposed to be funny. OK, now we're laughing. There's nothing more powerful that a Firefox lover. OK, maybe an Apple lover but they're both freaks anyway. 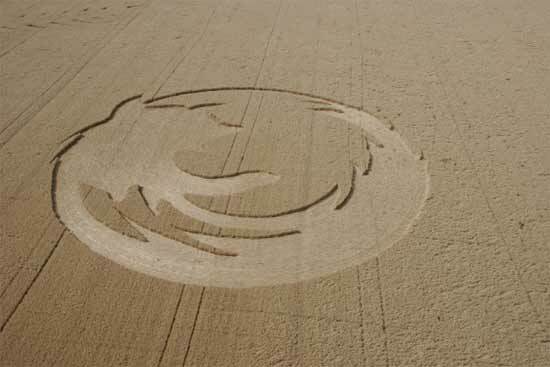 Ariel tells us a bunch of Firefox lovers in Oregon went out an created a crop circle in the shape of the Firefox logo. A team of 12 people did it in 24 ours and it's 220 feet in diameter. 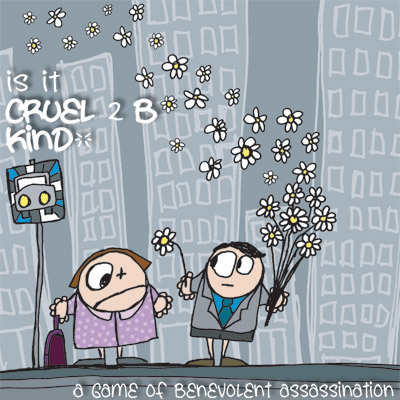 If you want all the nitty gritty details on how they accomplished the task, it's all here ad-nauseam. 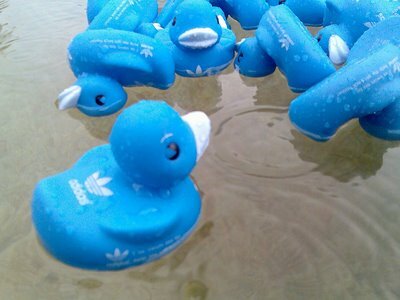 Thomas Christensen tells us that during Copenhagen Fashion Week, Adidas placed blue rubber ducks in a fountain with a message on the bottom that read, "I've swum too far - help me get back home! Reward for my return at adidas Original store". Upon visiting the store, Christensen ended up with a t-shirt. Perhaps there really is some sort of cultural brick wall between New York City and Canada or at least between Montreal's National Bank marketing team and the rest of the entire world. In a laughably out of touch press release, the bank claims it is "once again on the cutting edge of advertising with a colourful new event: a flash mob, used to promote the Bank's role as the presenting sponsor of the Rogers Cup tennis tournament." Colorful new event? Hello? Flash Mobs came and went three years ago, my Canadian friends. It's 2006 this year, not 2003. If calling a three year old trendlet cutting edge weren't bad enough, the bank isn't even conducting a flash mob. All it's doing is unleashing 40 young women dressed in tennis apparel who will roam the streets of Montreal during rush hour August 9 passing out tickets to a tennis match at the Rogers Cup August 12 to 20. Idiots. That's not a flash mob. That's street marketing.